The British Gazette » Famous last words: If Brexit is worth doing, then it is certainly worth doing well; regardless of how long that takes…. Today’s title contains the words from a phrase used by Phillip Lee, the Member for Bracknell in his resignation statement as Parliamentary Under-Secretary of State for Youth Justice, Victims, Female Offenders & Offender Health. Mr Lee was so very 21st Century in the method of communication he chose to convey his resignation: Twitter! Mr Lee is a “Remainer” and is on record that he would support a second referendum on the final Brexit deal. Mr Lee became the Member for Bracknell in 2010 and is still a practising GP. 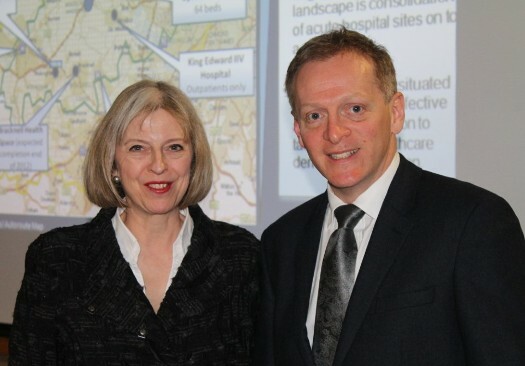 The above image was taken some time ago and shows Mr Lee with Madame Mayhem when she was Home Secretary. This image was chosen as it shows the sheer levels of stress involved in politics today as the two look considerably older today. Ever since Midsummer’s Day 2016, this organ and Dr Richard North (http://eureferendum.com/) have sought to point out the problems contained in the statements and actions of many who describe themselves as “Brexiteers”. Time after time after time after time, we keep restating the obvious; If something is impossible; it is! During the referendum campaign, Doctor North attempted to persuade some of those campaigning for Brexit to adopt Flexcit (http://www.eureferendum.com/documents/flexcit.pdf). They did not. Instead they chose to offer the voters something else. A vision of “Brexit Britain” that was more appealing than that contained in Flexcit. They argued – correctly – that their alternative would appeal more to the electorate and get more votes. Increasing the chances of the Leave campaign winning the vote. Furthermore, in the event (that was thought likely by some) that the Leave campaign would loose, the tactic of offering their glowing vision of “Brexit Britain” would assist them in their ongoing political campaign against the EU after the referendum. This was something that certain persons in UKIP thought for a closely fought referendum with “The Chameleon” winning by a small margin would mean a victory for the lies of “Project Fear” and set up UKIP very well to increase their vote and the number of MEPs in June 2019. However, history did not work out that way. The referendum campaigns of the two sides were both dishonest – with the Leave side being the more so. Thus it was that on Midsummer’s Day 2016 the lies told by the Leave campaign resulted in 52% of Britons voting to have these falsehoods put in place. And there we go to the very nub of the issue! When He was on Earth, the Good Lord used parables to make a point. Thus the British Gazette will follow the example of the Godhead Himself and do likewise! Once upon a time there was a little girl, Anna, who wanted a pony. The little girl’s father was a financier and two gentlemen wanted very much his custom. One of these was an Old Etonian, one David Cameron. The other was Nigel Farage, an Old Alleynian. Since the little girl’s father, David Soubry was a friend of Cameron and was also an Old Etonian, Farage knew that he was unlikely to get the business. However, he wanted to queer the pitch of his competitor so he hatched a cunning plan! Thus, whilst his competitor promised the little girl a pony, Farage promised her a unicorn! This was all very well, but for the fact that the little girl’s father being so pestered by his daughter handed Nigel Farage the contract on the basis that he deliver a unicorn to his daughter. Now at this point Nigel Farage realised he had a problem as unicorns do not of course exist! This “little difficulty” however did not fluster Nigel Farage! Instead he contacted his friend, Donald the Healthiest and Fittest Man on Planet Earth Trump to supply him with a unicorn. The Healthiest and Fittest Man on Planet Earth accordingly handed the task to his good friend, Vladimir the Most Macho Man on Planet Earth Putin to supply the animal. Now most men faced with the task of supplying a unicorn to a little girl in Surrey would blanch at the prospect, but then we other men are mere wuses when compared to the Most Macho Man on Planet Earth! Mr Putin achieved the seemingly impossible by the simple expedient of purchasing a grey (white) pony and having a veterinary surgeon surgically attach an artificial horn to the animal’s forehead! The animal was duly delivered to the delight of the little girl. Nigel Farage was beaming broadly. As he does! Now if we assume that Madame Mayhem is as aware that the Brexit desired by UKIP and Mr Rees-Mogg is like a unicorn, a fantasy, she will be trying to engineer a situation where this does not happen. IT is possible that the Remianers in Parliament may very well force a second referendum of the deal offered by the EU is unpalatable – that it will be unpalatable is a racing certainty! Thus in place of the general election envisaged by UKIP’s current leader Gerrard Batten we might have a second Brexit referendum held before 29th March 2019. If this is the case, Brexit will not take place. Those in UKIP will be angry and distressed! But they have one thing to be thankful for: They don’t have to supply a unicorn!